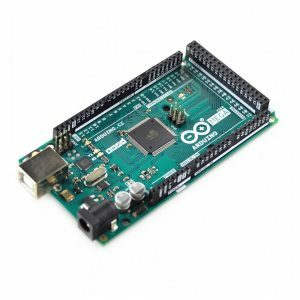 Arduino is a 15-year-old brand and I believe that nowadays everyone with even a minor interest in technology may be owning one of these microcontroller boards. But how many of you are actually using it or have ever made a useful project with it? Sometimes the Arduino is abandoned on a shelf or lays resting in a drawer because of a lack of inspiration, time, missing information /education. There is a ton of documentation, sketches (sample code), and books available out there and on the “wild internet”. 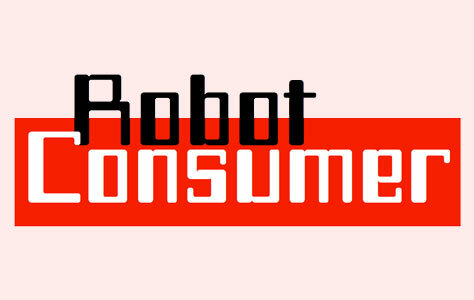 The magic behind the popularity of Arduino is that it’s an open source device. This means most of the information can be found online, and everyone has access to the main code and is free to modify it. But if you want to push your knowledge a little bit further, I suggest you buy or borrow a book. It can be pretty hard to choose a book only by its cover. You may wonder “What does this book have to offer more than another one?”, or “Why should I pick this one rather than that one?”. That’s why I decided to try this wonderful book: “Arduino Cookbook” and write a review of its general content. In the same time, I could figure out if the information it contains is rare or may easily be found on the Internet. First of all, from the first look at the cover, I could say that this book would please me. It features a bunny toy with some gears and abstract mechanics inside its belly. It is pretty obvious that this book is intended for inventors, “geeks”, and curious-minded persons. But what about beginners in electronics? Well, this is an Arduino related book, not an electronics book. And the author is not trying to hide it. In the very first chapter, he lets you know that there won’t be any explanation of basics electronic concepts. In my humble opinion, this is all right because if you really want to learn about electronics, there are several other books available for you. Keep in mind that if you are interested in this field, you should at least know what a resistor and a capacitor are, understand the function of a transistor, and know the basics of logic gates. If you’re new to the world of Arduino, this book will teach you the basics: how to set up your board, install the Arduino program, what programming language to use, and how to communicate with the processor. Once you’re done with the software and basics, you may proceed further in the book. This is where I figured out how much this book was aptly named. The ‘Arduino Cookbook’ features over 200 projects that can be accomplished with an Arduino board, some electronic parts, and simple coding. This book can be summarized as a “bible for digital designers, engineers, and inventors”. With all the recipes these pages contain, you will be able to create many wonderful projects and accomplish any project you set out to create. It goes from driving servo motors with the appropriate shield to storing data in permanent EEPROM, connecting and using LCD display, audio output, infrared commands, wireless communication, Ethernet, and networking functions (to name only a few). A great project you may try with this book. Here are some of the interesting learnings found in this book. Did you know that you could create a clock with the help of the Arduino board? The Arduino quartz crystal is good for timing and would lose only about a couple seconds per day. Through this project, the book is teaching you how to “set the time” function. In a completely different section of this book, you will also find how to display information on an LCD. In an early chapter, you will learn how to drive a relay with the Arduino board. Near the end, it describes how to create code to send a message through the internet. 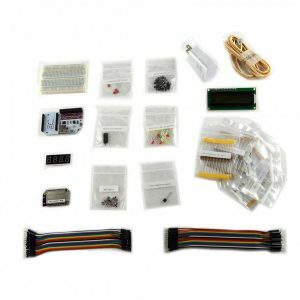 You may say to yourself: “Wow – they just listed a bunch of random capabilities of the Arduino”, but you should look at the bigger picture. With the help of this book, you could create a home automation system that will trigger lights, music and temperature control on a schedule and send me states of my sensors in an e-mail message. Great, right? That way, you could keep track of what’s going on into your house and with a small text command, could turn on the lights when my guests arrive! Actually, this is only a tiny example of what you may learn and “cook up” with this book, and this is an even smaller fraction of what the Arduino board is capable of. With the help of the Arduino Cookbook, I just felt like I needed more than ever an Arduino Mega to achieve bigger and bigger projects. If you consider yourself a “geek hacker”, you will enjoy the section on “using a Wii Nunchuck accelerometer” and even more this chapter on “how to display text on a TV“! Finally, is it for you? This book is intended to quickly help you learn about of the Arduino line of products and programming. It will help you design, combine and create all the circuits and projects you’ve been dreaming of, but couldn’t figure out how to. To be honest, I didn’t know the Arduino was capable of that much before taking a deeper look at this book. When the only limit is your creativity, don’t waste time on searching for recipes on the net. 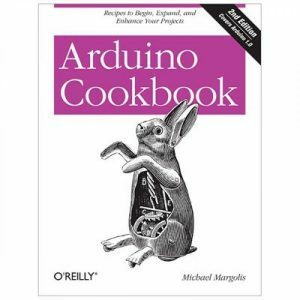 Use the Arduino Cookbook and start crafting your dreams today!